Add a bit of sand and a shell or two for a neat beach themed wedding favor. 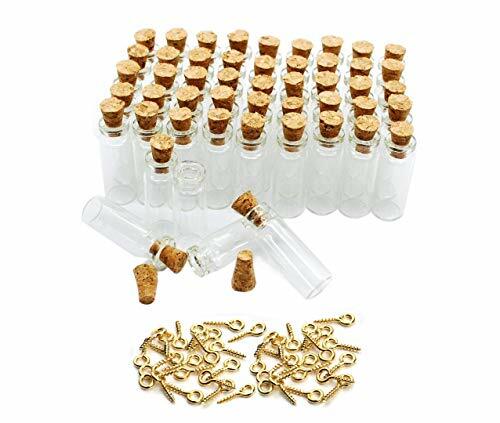 Material: glass and wooden stopper; Used for these small vials: message bottle, samples, scrap-booking, blood vials, wedding favors, wedding decorations, storage accessories. NOTE:These bottles are made of glass and fragile, very tiny and cute, pls check its size before purchase. Thank you! ★(Pack of 50) Small Mini Tall Clear Glass Bottles Jars with Corks Stoppers ,Color:Clear.Size:11*35mm(1.3*0.4 inch). Quantity:50 Pcs.Package include: mini glass bottles;Eye Screws;Corks Stoppers. ★ Tall Clear Slender Glass Bottles with Corks for Favors, Crafting and Creating,DIY and art decoration, you can enjoy the process of self-creation.Great Gifts for Friends, Mothers and Children. ★ Add a bit of Sand and a Shell or Two for a Neat Beach Themed Wedding Favors and Decorations.Wishes Bottles, You Can Write Down your wish on a Small Note and Put It into the Bottle. ★Packed each order in bubble bag which reduces the broken rate for the glass bottle.Great for jewelry making, altered art, miniature art, etc. ★Material: Glass,Wooden Stopper.Used forThese Small Vials: Message bottle, samples, scrap-booking, Blood Vials, Wedding Favors, Wedding Decorations, Storage Accessories. If you have any questions about this product by JKLcom, contact us by completing and submitting the form below. If you are looking for a specif part number, please include it with your message.